Formula MASS Weight Gainer for canines is a innovative blend that provides highly digestible fats, proteins and carbohydrates to sustain energy for the athletic dog. The high energy density of Formula MASS Weight Gainer is derived from premium quality fats that are of high nutritional value. 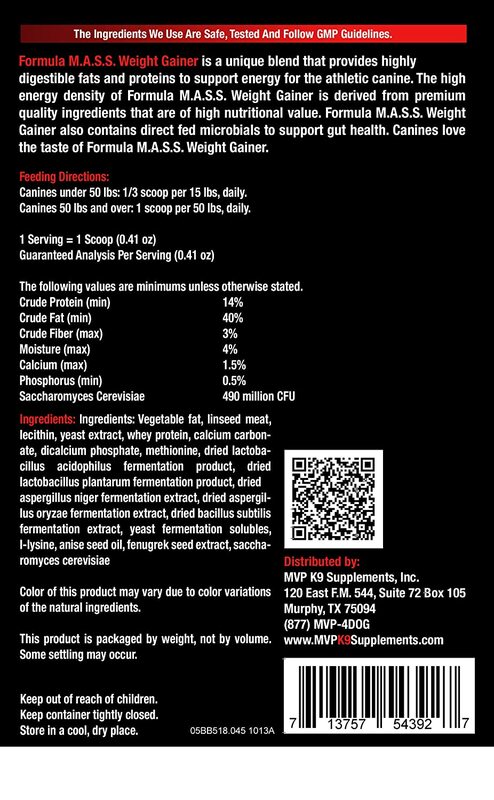 Formula MASS Weight Gainer also contains direct fed microbials to support gut health. Dogs absolutely love the taste and aroma of Formula MASS Weight Gainer. Formula MASS Weight Gainer for dogs is the most advanced product available to help maintain the weight of all classes/breeds of canines without subjecting it to the stresses of unnecessary over feeding. Formula MASS Weight Gainer for dogs can be added to your canine's daily diet. Simply add the recommended dosage to your dog's kibble and shake. The palatable powder contains a binding agent with excellent flavor release and great aroma. Our formula is designed to make enhancing your dog's healthy calorie intake easier, and no water is needed. Feeding Directions: - Canines under 50 lbs: ⅓ scoop per 15 lbs, daily. - Canines 50 lbs and over: 1 scoop per 50 lbs, daily. Dog's That Are On A Raw or Grain FREE Diet: For better gains, nursing mothers or severe cases increase the daily dosage by double. In addition, it is important to convert these calories into quality muscle so we recommend that you combine this product with the Muscle Builder & Performance and exercise daily. Please contact us prior to use so we can give you expert advise to maximize your results!